I joined yet another challenge group! This one is the Improv Challenge, a monthly party hosted by Frugal Antics. For this party, everyone takes the same two assigned ingredients, and comes up with an original dish. My contribution is (are?) 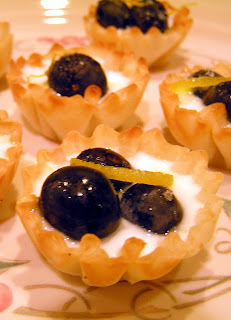 Lemon-Blueberry Tartlets, mostly because the local Try-n-Save had a sale on blueberries and mini-tart shells. The base is exactly like lemon curd. Except without the egg yolks. And the butter. Okay, it's nothing like lemon curd. The fat and calories are replaced by sour cream and speed. This is a fast recipe to bang out. But since it requires a tool considered exotic by my favorite non-cooks, I am not allowed to call it easy. But if you can handle a citrus zester without impaling yourself, then this dessert is a snap. And very addicting. Do not sneak a taste before serving, or else the 12 tartlets with quickly become 6. No recipe today. Just wanted to share an awesome gift I received. A former classmate and co-worker visited me at work today. I last saw Jean a month or so ago when I did a work-related favor for her. To me it was small, but to her it was a major big deal. Fast-forward to today, when Jean walked up to the reference desk and plopped a gift bag in front of me as a belated thank-you. 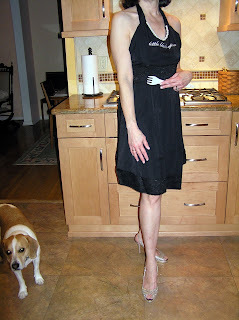 Yes, I always cook dinner in Jimmy Choo's. It's got a strand of pearls sewn right in. Mrs. Cleaver, eat your heart out! Thank you so much, Jean! Yesterday I made baked chicken. The recipe came about because of an opened bottle of wine. TheHubby and I shared a bottle of red wine with dinner last week. I re-corked the remainder and shoved it into the back of the fridge, forgetting about it until Monday, when I shifted items around to make room for groceries. The wine wasn't quite up to it's original flavor, but was deemed good enough to put the chicken in danger of a DUI. If it could find where I hid the car keys. I only added a little salt, pepper and rosemary. Nothing complex, just a very nice and easy weekday dinner. If you prefer something a little more fancy-schmancy, remove the cooked chicken from its pan to a covered dish. Place pan over burners and bring sauce to a boil, scraping up tasty brown bits with a wooden spoon. Continue to boil for around 5-10 minutes until sauce is reduced and slightly thickened. Then plate chicken and spoon sauce over it. Schlepped into NYC on Thursday for my semi-annual check-up (trains and automobiles, no planes, although we did have to walk almost across the entire width of Manhattan island ... with all that traffic it's faster than a bus or cab). All my (remaining) parts were determined to be working correctly, so theHubby and I triumphantly schlepped back home to NJ. Unfortunately, some of the junk lunch we had along the way didn't quite agree with him so I figured a little comfort food for dinner was in order. 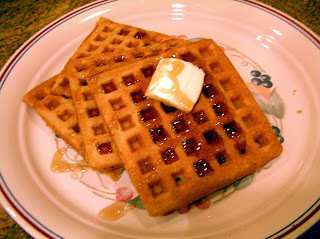 I suggested waffles, to which theHubby said, "Why, not?" Which from him meant, "Oh, yes, PLEASE!"